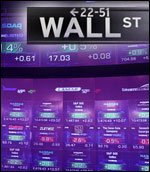 Stocks have moved sharply lower over the course of morning trading on Wednesday after ending the previous session firmly positive. The major averages have all shown significant declines, more than offsetting yesterday’s gains. Currently, the major averages are just off their lows of the session. 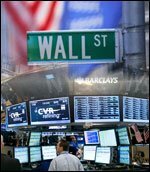 The Dow is down 274.54 points or 1.1 percent at 25,025.38, the Nasdaq is down 119.48 points or 1.5 percent at 7,751.41 and the S&P 500 is down 32.22 points or 1.1 percent at 2,807.74. Renewed concerns about Turkey have contributed to the sell-off on Wall Street after the Turkish government announced an increase in tariffs on American cars, alcohol and cigarettes. The move is likely to intensify the dispute between the U.S. and Turkey, which recently dragged the Turkish lira down to a record low. The clash between the U.S. and Turkey also comes amid the ongoing trade dispute between the U.S. and China, which has raised concerns about the global economy. 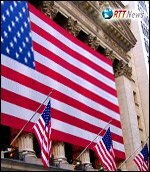 Traders are also digesting a slew of U.S. economic data, including a report from the Federal Reserve showing a smaller than expected increase in industrial production in the month of July. The Fed said industrial production inched up by 0.1 percent in July after jumping by an upwardly revised 1.0 percent in June. Economists had expected production to rise by 0.3 percent. A separate report from the Commerce Department showed retail sales climbed by more than expected in July, although the report also showed a significant downward revision to the sale growth in June. The Commerce Department said retail sales rose by 0.5 percent in July compared to economist estimates for a 0.1 percent uptick. However, the report also showed the increase in retail sales in June was downwardly revised to 0.2 percent from the 0.5 percent previously reported. Partly reflecting growing affordability concerns, the National Association of Home Builders also released a report showing a modest deterioration in homebuilder confidence in the month of August. The report said the NAHB/Wells Fargo Housing Market Index edged down to 67 in August from 68 in June, matching economist estimates. Gold stocks have shown a substantial move to the downside on the day, dragging the NYSE Arca Gold Bugs Index down by 5.4 percent to its lowest intraday level in well over two years. The sell-off by gold stocks comes amid a notable decrease by the price of the precious metal, as gold for December delivery is tumbling $11 to $1,189.70 an ounce. A sharp drop by the price of crude oil is also weighing on energy stocks, with crude for September delivery plunging $1.26 to $65.78 a barrel. 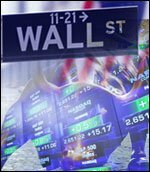 Steel, semiconductor, computer hardware and retail stocks are also seeing considerable weakness, while utilities stocks are among the few groups bucking the downtrend. 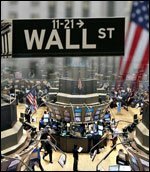 In overseas trading, stock markets across the Asia-Pacific region moved mostly lower during trading on Wednesday. Japan’s Nikkei 225 Index slid by 0.7 percent, while China’s Shanghai Composite Index plunged by 2.1 percent. The major European markets have also come under pressure on the day. While the French CAC 40 Index has tumbled by 1.8 percent, the German DAX Index and the U.K.’s FTSE 100 Index are down by 1.6 percent and 1.5 percent, respectively. In the bond market, treasuries have shown a strong move back to the upside after closing lower in the two previous sessions. Subsequently, the yield on the benchmark ten-year note, which moves opposite of its price, is down by 4.9 basis points at 2.846 percent.